Justin Timberlake has been suffering from an identity crisis in recent years. His acting talent and hilarious SNL spoofs have bumped the singer role further down on his resume. At one point, the former mousketeer risked being a Disney boy band bomb. However, at a sold out Baltimore Arena Monday night, some 20,000+ got to see just how extraordinary an artist he is when the singer shows up. At 33 years old. JT has long flirted with being relegated to boy toy pop star stereotypes. 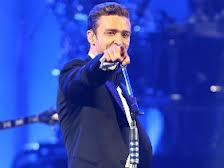 However, Timberlake is a pop music monster rightfully drawing comparisons to MJ. The 20/20 Experience is a mammoth tour with glitzy production and perfect ear shattering sound that rivals “The Wall.” The very scope of the show has challenged the structural integrity of every tour venue. Being in the middle of a chaotic storm of lasers, smoke, pyro and 50 foot video screen images is daunting, but the second he and the band rise stealthily backlit from the floor, you know this man has it all under control. Despite his youth, he is a throwback artist in many ways. He respectfully starts on time and wears a suit. He can actually play piano and guitar. The incredibly enthusiastic Tennessee Kids band is an amalgam of funk, soul and rock and paints a texture on every song. After opening with the soulful Pusher Love Girl, the Memphis, TN native strutted, swerved and funked his way through a massive 33-song set. Several times he mugged for the camera, praising the adoring sellout crowd and quipping, “The last time I was in Baltimore, it was with Jay (He of course meant fellow hip hop monster Jay Z. )” With guitars scorching and horns blaring, the band showcased its talent with a full on auditory assault during TKO. A large chunk of the second set was performed literally inch by inch when a portion of the elaborate main stage platform elevated 50 feet while the ensemble was line dancing and slowly traveled the length of the floor. He used the time to pay homage to Elvis saying, “I’m from Memphis, so this is for the king.” He launched into a spot on cover of Heartbreak Hotel on acoustic guitar. He tipped his hat to MJ with a version of Human Nature that was instantly a collective sing along. He closed with a powerful version of Mirrors while bathed in lasers and spotlights. I’ma leave it all on the floor tonight.